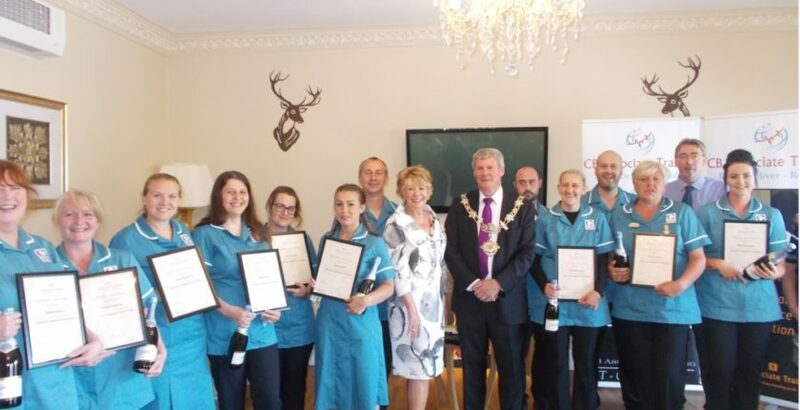 North-west operator Century Healthcare has held a graduation ceremony to honour its staff who have qualified as Care Home Advanced Practitioners (CHAPs). The CHAPs programme, which is part of Century Healthcare’s bid to combat the national shortage of qualified nurses within the care home sector, enables staff to work alongside their nursing colleagues and take on additional responsibilities such as applying simple dressings, recording blood pressures and supporting the safe administration of medicines. Angela Killip, Operations Manager for Century Healthcare, said: “I am extremely pleased that all the staff passed the course with flying colours. The staff were handpicked by the home managers because of their many years of experience and their dedication to older peoples care. The successful students were presented with their graduation certificates and a bottle of champagne by company chairman Lorraine Matta and Mayor of Fylde Councillor Peter Collins.